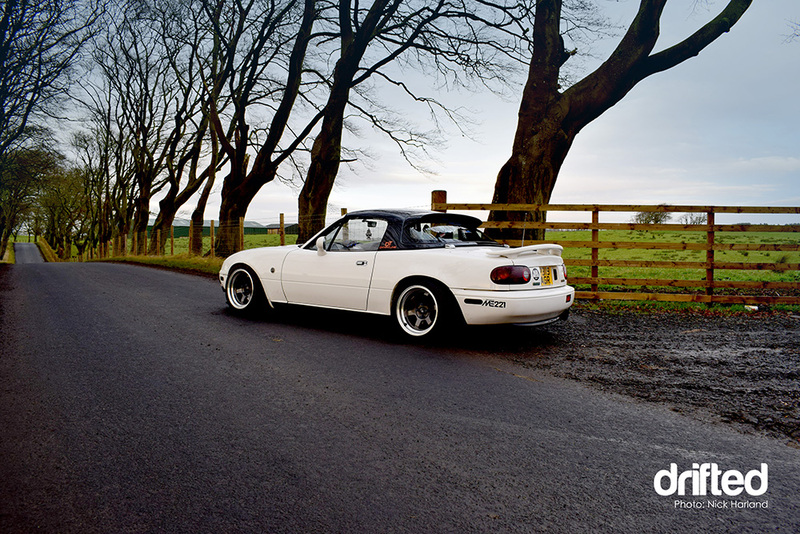 Nick Harland shines the spotlight on this immaculate white Mazda MX5 Mk1 turbo drift car. So the decision had been made. Plans had been put in place and it was a go! I had just organized to write and shoot for Drifted.com and man, I’m pumped! 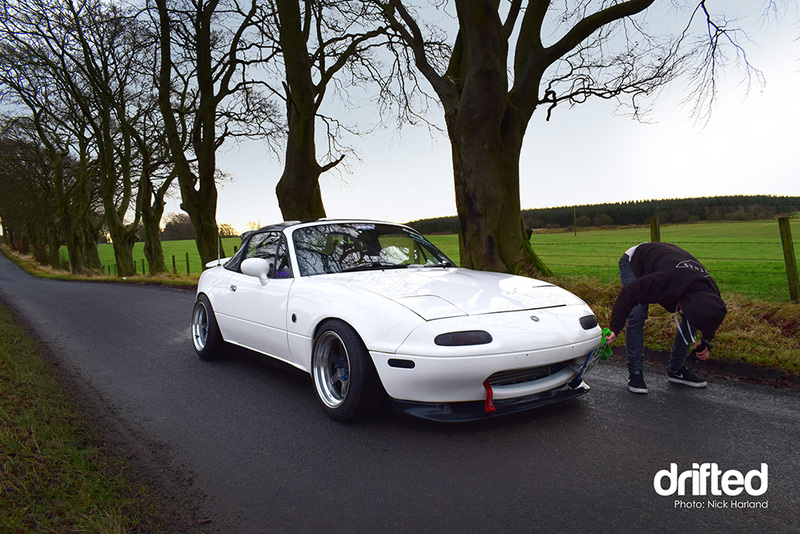 I already had a selection of choice first shoots in my head, the first coming to mind had to be Josh with his super clean Mazda Miata Turbo. So much JDM goodness, so clean and man has he done it right! It was an early Saturday morning, gear packed, car loaded and heading for the meet to grab Josh before we headed to the spot. I had researched the location the weekend before and I was aiming for the right time of the day for the best lighting. We met at a local train station I was running late (as per usual! ), met Josh and we were off, as we pull away with an almighty turbo spool and burst of air. There is nothing more attention grabbing than that, it produced an instant grin on my face. We got set up at the shoot location, and Josh and I set about giving the car a wipe down. The location was pretty dirty, off the beaten track so the car had collected some dirt en-route. 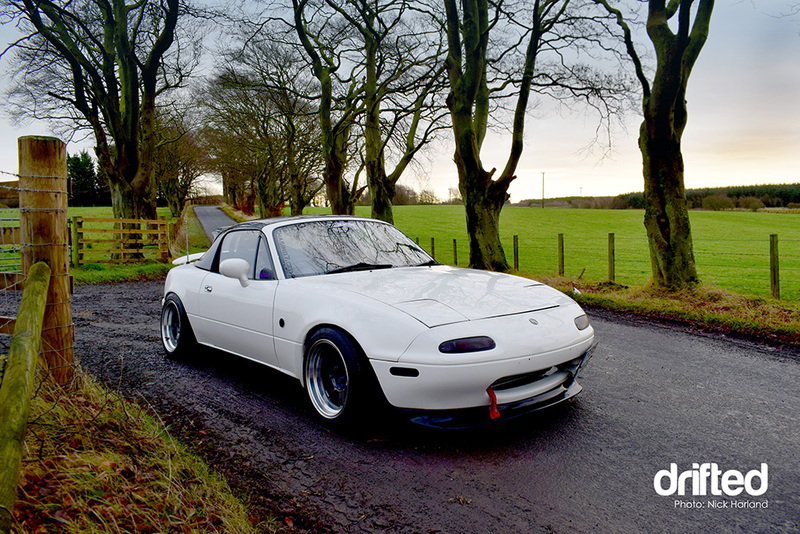 This car is something special and rightly so, Josh has had a few Miata’s /MX-5’s so before attempting this build he knew exactly what he was after. As most know MX-5’s suffer from dissolving back into the ground with the dreaded rot if not cared for properly. Josh also has a tasty “Mariner Blue” Miata, which he unfortunately, found suffered a similar fate. So a new base was required for his dream turbo build. 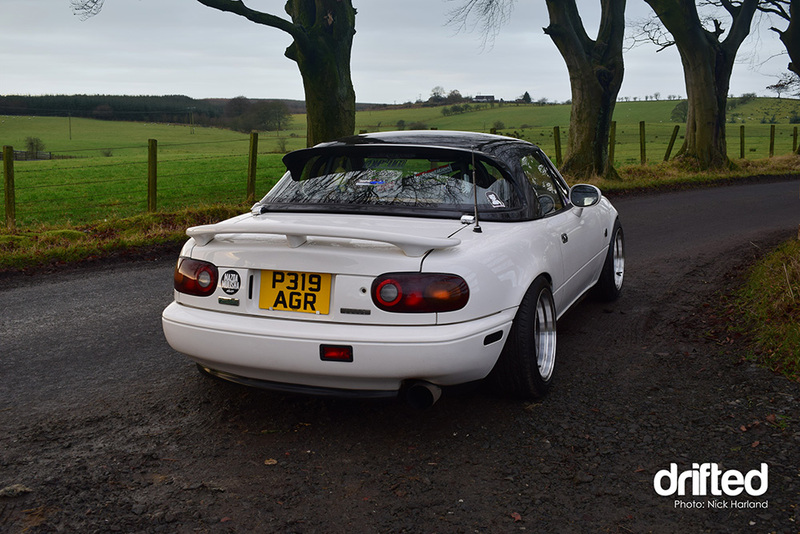 This crisp white example has been around the UK MX-5 circles for a few years, staying super clean and being well cared for – not one bit of the dreaded rot in sight. Josh was certain when he stared this build all the tool work was being done by himself, with exception of the mapping and electronics. Built over a two month period of evenings and weekends, waiting on parts being delivered was a regular occurrence for Josh. So with the help of a few friends this little boosted Miata was born and after being sent to Chris at Dynatune, it was tuned and ready to go. I know Josh personally being a fellow Mazda owner. 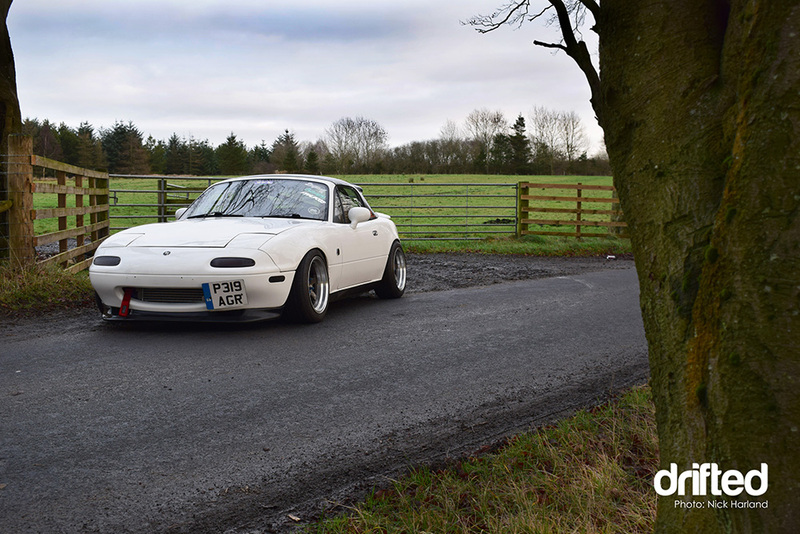 Josh was introduced to the drifting life by our friends Cameron and David, he has always enjoyed fast cars so it didn’t take long to get him into a RWD platform looking to loose a little traction. I have been lucky enough to be in the passenger seat with him while driving a private drift day at the infamous Driftland in Scotland (more on this drifting mecca to come). Josh is very modest with his talent and explains that he is fairly new to drifting, with only a few track days under his belt. But I can testify while being sat in his passenger seat he has a natural affinity with his car and while other more powerful cars were sliding around the track that day, Josh really impressed me. Josh was one of the most capable drivers that day, enjoying a good clutch kick and pushing his little Miata hard. Sitting inside of Josh’s snug Miata has given me a new found love for a well sorted interior. 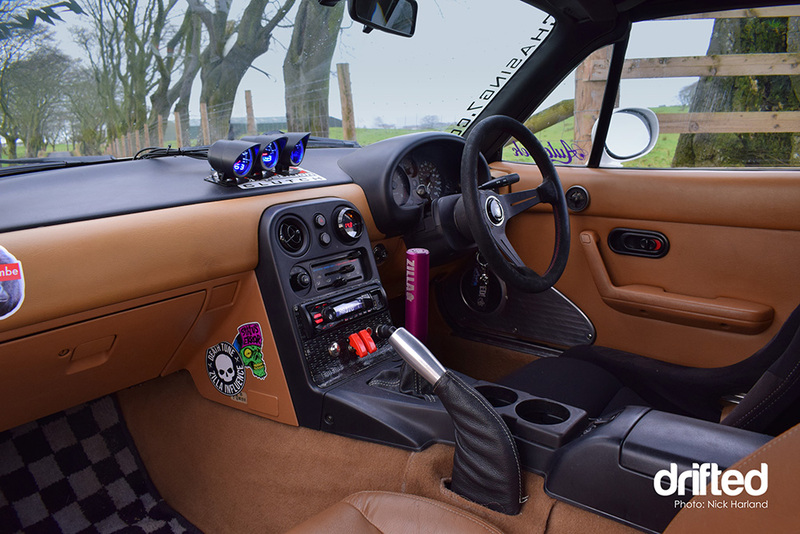 The combination of a tan interior and white exterior is something else – something a little unusual for a drift car! 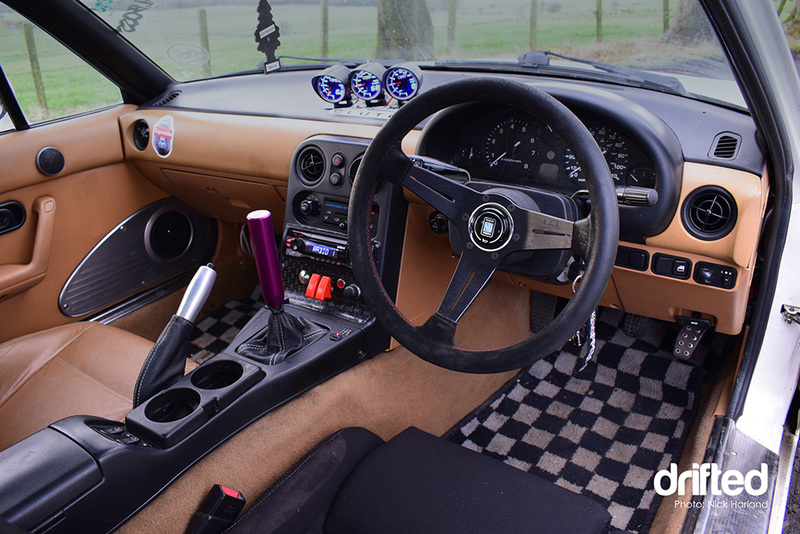 A purposeful approach has been taken turning the car’s interior into a cockpit. A Corbeau Bucket, Nardi steering wheel and Pro Sports gauges show all the right signals for a car that has been tastefully built. This car is no “chocolate teapot”, that’s for sure. I jumped at the chance of a shoot so soon, simply because he has more plans for the little car. Unfortunately heat soak and cooling issues are causing Josh some problems so he is planning to improve this with a larger radiator and a few other tweaks. Luckily he was nice enough to hold off on these changes so we could organise this shoot. 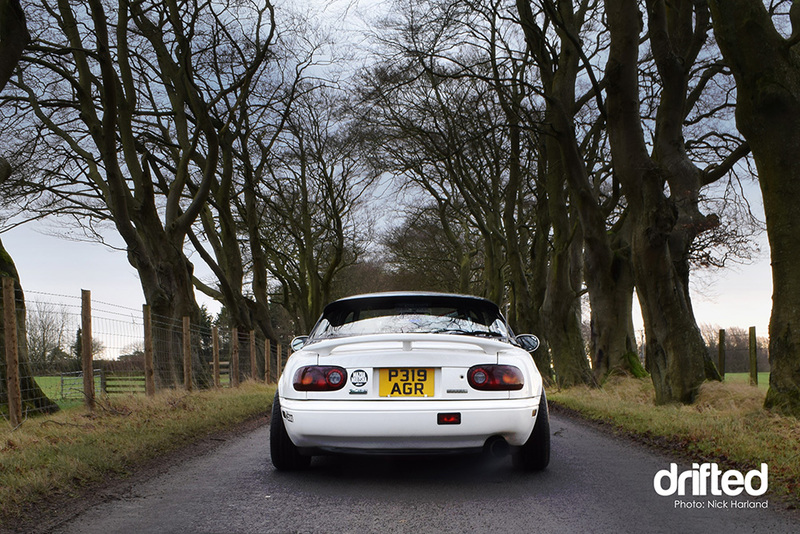 Check out some more MX-5 articles on Drifted. Want to get your own Miata sounding on point? Try our Miata exhaust guide. Interested in forced induction? 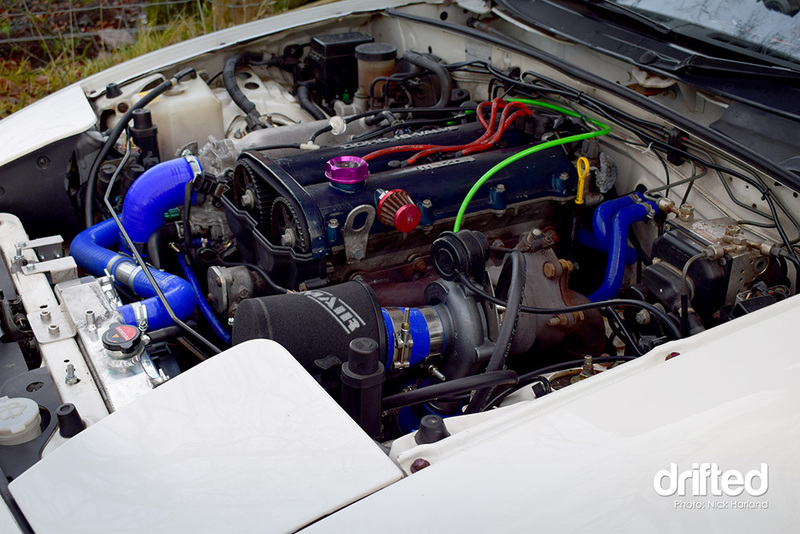 Check out our Miata supercharger guide.